Breakthrough ease-of-use and punching precision from this durable 2-hole punch. Smoothly punches 28 sheets of 20 lb. paper - with 50% less punching effort! Padded handle for added comfort. All-metal construction for years of reliable performance. Superior cutting action with patented pin technology - delivers clean and precise 1/4" holes. Efficient locking handle for easy storage. Adjustable paper guide for control. Works fine... so far so good. No more pounding on your hand to hole punch papers. This does it with ease. Love how easy it is to use! I use it daily! Purchased one of these 2-hole punchers to use in my classroom for enrichment folders. It gets used on a daily basis by me and the students. It has never (and I truly mean never) given me any trouble at all, which comes as a surprise since middle school aged kids don't always treat their supplies with care. Easily tackles a full stack of sheets without having to pound the handle and bruise my hand. It's about time! I would definitely recommend this product for anyone to use. Welcome to MyBinding video. 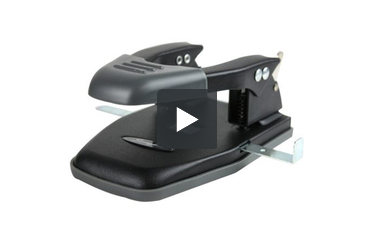 Let's take a look at the Comfort Handle two-hole punch by Swingline. Simple, easy to use, and all-metal durable construction, this is a great two-hole punch for on the go. There's a fully adjustable paper guide for flexibility and a no-skid chip tray on the bottom to keep it in place. Simply unlock it with the pin on the back and replace the lever. Place your papers in, center them up, and press down. Patented pin technology creates precision cutting of quarter-inch holes, up to 28 sheets of 20lb paper in one punch. All the punched chips fall into the tray easily below, easily disposed of. And the rubberized handle is very comfortable. That's it, that's Swingline's Comfort Handle two-hole punch. For more demos, reviews, and how-tos, check out MyBinding.com. how is the paper guide used. Thank you for taking the time to write this message! In order to use the paper guide, you have to insert the metal guide into the slot on the right side of the punch. When you're inserting the metal guide, make sure it goes on top of the black piece in the center. You can now slide the paper guide to your desired length for accurate hole placement. You can use all 20 sheets at once, the capacity for this hole punch is 28 sheets. I currently have this product, but have a newly diagnosed latex allergy. Does the product contain any latex? The handle is latex free.